Steven Capsuto has presented video-illustrated talks at dozens of universities, conferences and community events since 1990. His book Alternate Channels: The Uncensored Story of Gay and Lesbian Images on Television was a semi-finalist for the Stonewall Book Award in 2001, has a five-star rating on Amazon, has been used in college courses, and is widely cited by other authors. He began researching the subject in the 1980s while volunteering at a crisis hotline. Many of the callers were suicidal gay teens who had built their self-image on the grim depictions seen on television at that time. Steven has contributed media-history articles to periodicals and reference books, has presented papers at academic conferences in several countries, and served on the research teams for documentaries seen on PBS and Bravo cable (including The Question of Equality and TV Revolution). 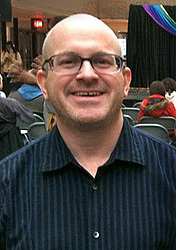 He was the head archivist of the GLBT Archives of Philadelphia from 1997 to 2003, and has been involved in various social-justice causes since the 1980s. In his day job, he is a translator and translation project manager.